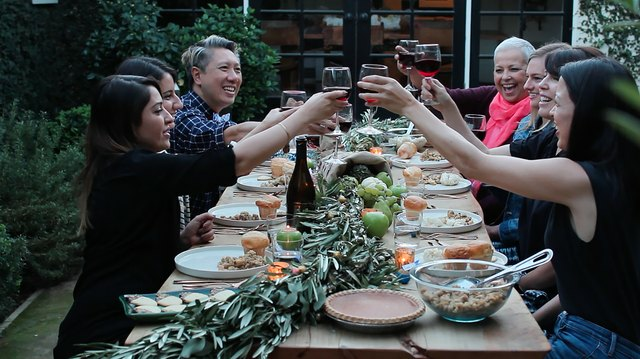 Give your guests a feast for their eyes — as well as their stomachs — with this gorgeous Thanksgiving tablescape that combines the rustic elements of harvest season with a modern and chic aesthetic. 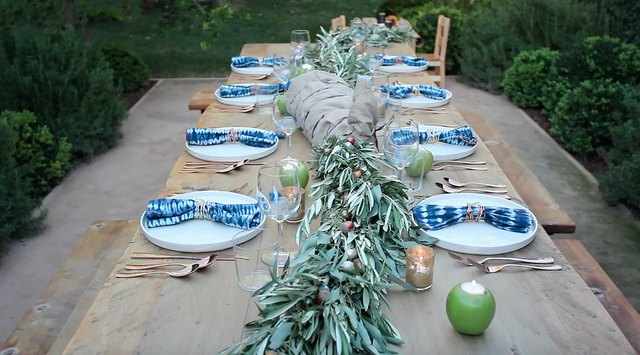 Start with a bare wood table and line the center with eucalyptus and olive leaf garlands that act as a table runner. 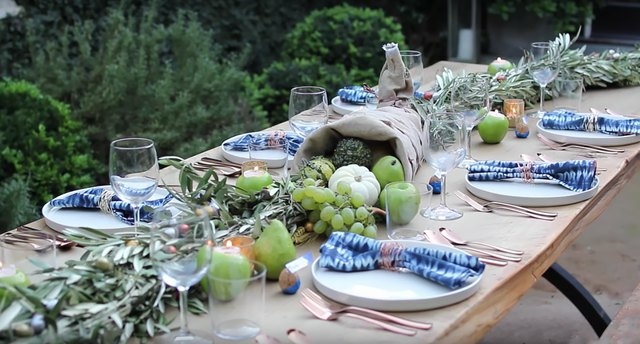 A little extra foliage hanging off the table's ends lends to a bountiful look. 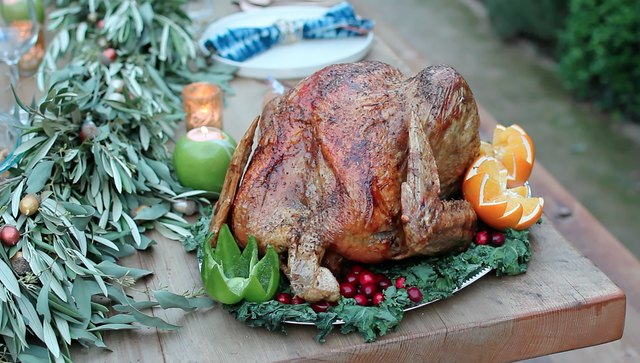 Tuck gilded acorns along the length of the garland for some mixed metallic sparkle. 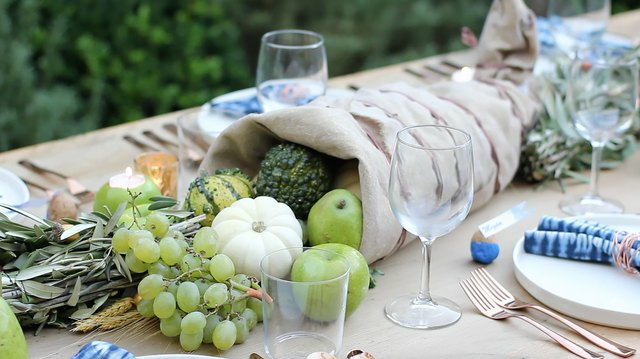 Center the table with an overflowing cornucopia featuring abundant harvest crops. We gave ours a bit of glamour by using metallic burlap and copper raffia. Give it a minimal, monochromatic twist by using only fruits and veggies in varying shades of green. Then, blend white pumpkins into the arrangement to create a bit of contrast. 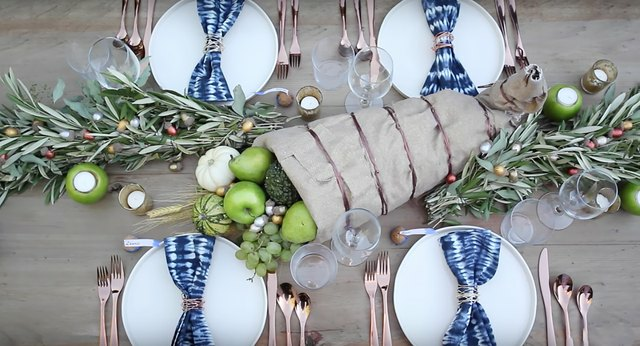 Shibori napkins are decidedly modern, especially when paired with gold and copper wire napkin rings. Simple white plates and clear glassware make the indigo color stand out, while copper flatware reinforces the overall metallic theme. Help guests find their seats with walnut place cards dipped in indigo paint and little white flags tipped with a matching blue watercolor. 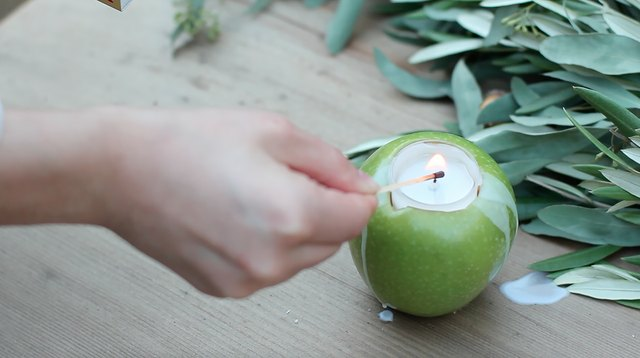 Reinforce the harvest theme with green apple candles that twinkle with tea lights. Contrast them with gorgeous faux mercury glass votives that shimmer and flicker along the length of the table. 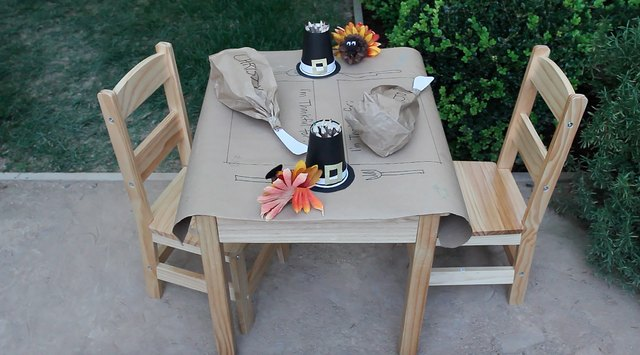 Even the kids' table can look festive with gratitude place mats drawn onto a simple piece of butcher paper. Pinecone turkeys and turkey leg place cards offer a bit of amusement and décor. Instead of crayons, set out rustic twig colored pencils. Display them in festive pilgrim hats made from black paper cups. Turkey may be the star of the table, but everyone knows that side dishes are what the folks really love. This season, mix up your mashed potatoes repertoire with this recipe twist. Traditional stuffing is definitely a crowd pleaser, but we think this gluten-free version is just as delicious. Don’t forget the gravy! And are you Team Pumpkin Pie or Team Pecan Pie? 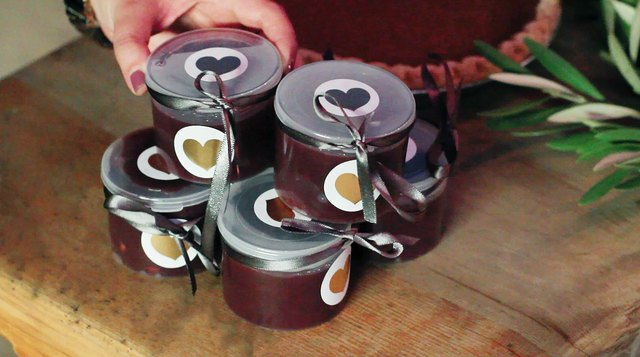 Express your gratitude to loved ones with homemade cranberry orange relish packaged in giftable jars. 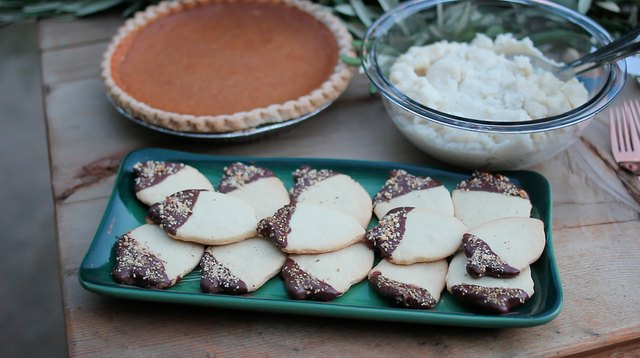 Acorn cookies are also a delightful dessert that guests can enjoy now or take home for later. 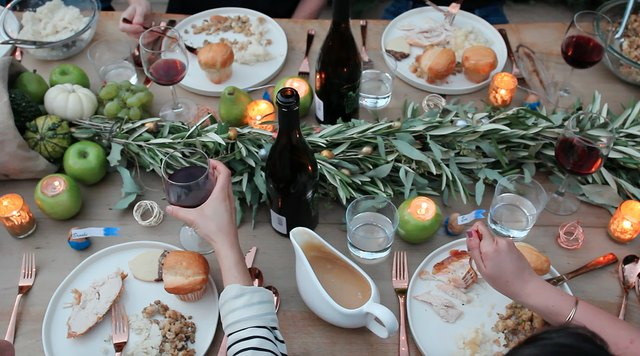 After all the food has been cooked, the table has been set and family and friends are gathered ‘round, remember that it’s not happy people who are thankful. It’s thankful people who are happy. Cheers!